Reduces the risk of Milk Fever by increasing the levels of calcium in the blood to a level that the cow will not suffer metabolic problems. Calcium deficiency after calving can lead to milk fever, especially from the second calving and later calving cows that are more sensitive. Sub clinical milk fever can be as high as 70% of the herd due to the lack of Calcium in the blood, the cow will have a lower feed intake and milk production. The cow is also more sensitive to other diseases. In the case of acute or, “clinical milk fever” the cow goes down. Calcitop bolus reduces the risk of milk fever by increasing the levels of calcium in the blood to a level that the cow will not suffer metabolic problems. Calcitop bolus instant release of Calcium offers 21 grams of two different calcium sources, Calcium phosphate as an inorganic salt – slower release 3-6 hours and Calcium formiate as an organic salt – fast release 1-3 hours. 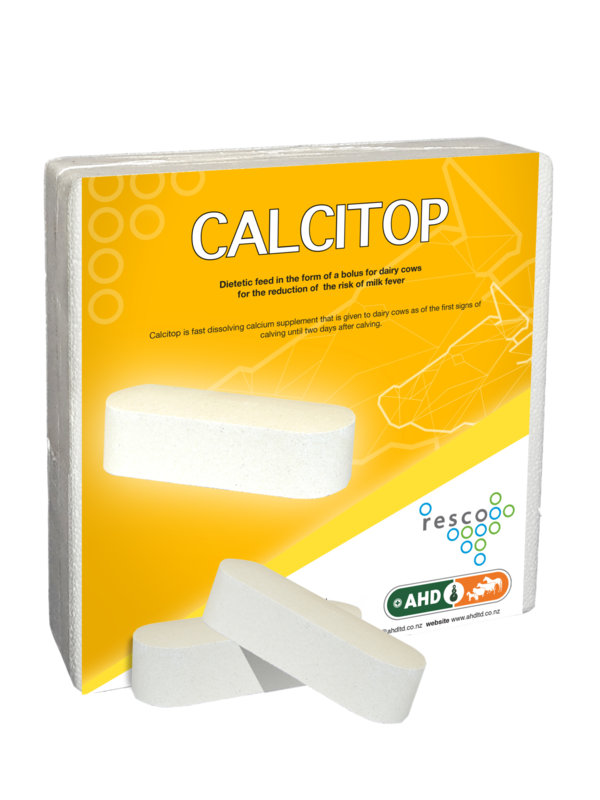 Calcitop also contains Vitamin D3, Phosphorus and Magnesium. 2 Calcitop boluses 12 to 24 hours before calving (42 g /Calcium) or, 1 bolus prior to calving and another bolus immediately after calving if required. The Calcitop bolus is the only Calcium bolus that offers 24 hours protection period and once inside the cow you know she is getting the Calcium required to combat milk fever. Do not attempt to administer a bolus to a “down cow” as she will not have the ability to swallow. In this instance it is recommended you use the AHD Metaboost or BlueCross CBG 40% Metabolic injection.